Indian retail and eretail congress (IReC) is a proven platform to bring Indian retail and eretail fraternity under one roof. 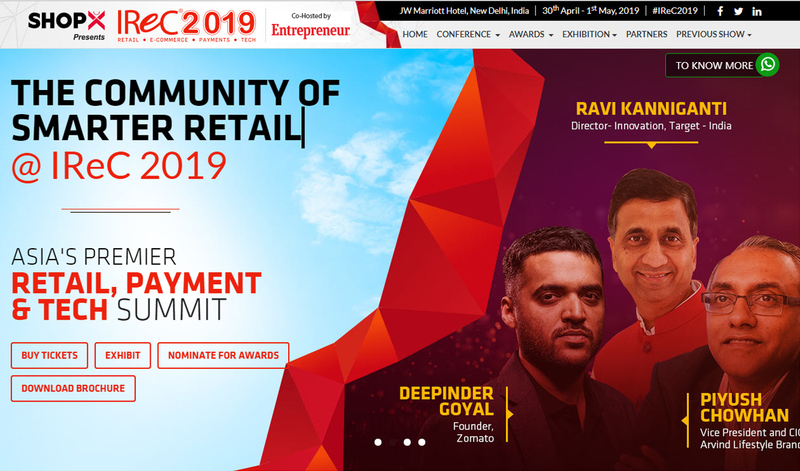 IReC 2019 is all set to host the retail power houses, game changing start-ups and technology disruptors ensuring umpteenth number of learning opportunities for everyone. The two-day long conference will begin on 30 April 2019 at JW Marriott, New Delhi. This time this gala event is scheduled to register the attendance of 600+ delegates and 100+ speakers from national and international retail arena. Immediately this address, there will be a fireside chat between Ritu Marya, Editor-in-Chief, Retailer Media and Vineet Gautam, CEO, Bestseller India. Mr. Vineet Gautam will particularly caste light on how artificial intelligence and robotics are changing the fashion business. Immediately following, Sahil Malik, Managing Director, Da Milano, Samir Modi, Managing Director, Modi Enterprises, Johnson Verghese, Managing Director, Fossil India, Dhruv Bogra, Country Manager, Forever New India, ME & SEA will discuss on how multichannel commerce brands can make retail spaces useful in order to create a better store experience and full filling the customer expectations. Day 1’s second keynote will be delivered by Vasanth Kumar, Managing Director, Lifestyle International. Being a big box retailer, he will explore his views on accelerated innovation and new technologies which ultimately helps in branding reach and prominence of the brand. On Tuesday, 30th April, there would a panel on next generation entrepreneurs which will be powered by Entreprenure Media. Anchit Nayar, CEO- Retail, Nykaa is one of the leading panelists in this session. Later in the same day, there would be a panel on how AI led automation is already proving a powerful advantage in retail. Sandeep Kulhalli, Sr. Vice President-Retail & Marketing-Jewelry Div, Titan Company Ltd, Balaji Viswanathan, CEO, Invento Robotics are the key panelists of this session. Immediately after the session there would be a break of 30 mins for networking lunch exactly at 1:30 pm. Post launch, the conference will resume at 2 pm. henceforth, the conference will proceed into hall 1 and hall 2 simultaneously. A panel will be hosted in the hall 1 themed around how to successfully take your digital business Physical. Panelists are the brand custodians which they have successfully achieved the O2O transition including Shivani Poddar, Co-CEO, FabAlley & Indya, Preeta Sukhtankar, Founder, The Label Life, Amisha Jain, CEO, Zivame. Parallel to this, a conference will held in the hall number 2 that would be themed around how brands are innovating themselves to attract the new age shopper. The panel will host imminent speakers including Ajay Kumar, Country Manager, Guess India, Ankur Damani, Country Head, LE Cruset. Immediate to this, the second keynote address will take place that will be delivered by Anurag Sehgal, Managing Director, Experiential Design Lab Pvt. Ltd. Next to this, a session will proceed on how eretail market is maturing for FMCG retail sales. The session will be addressed by Anant Goel, Co-Founder & CEO, Milkbasket and Manoranjan Pani, General Manager, Amul India. The next session will throw light on the role of retail CIOs is becoming challenging in fulfilling the omni channel journey. There would be keynote addresses from Vikram Idani, CIO, Reliance Retail and Sauvik Banerjjee, CTO, TataCLiQ will shed light on how automated conversations will improve customer engagement, and AI will lead the change. In order to win in the Digital era, Indian corporates need to up their ante and indulge with budding entrepreneurs to co-create and co-exist new age retail and ecommerce. At 3:30 pm, Ravi Kanniganti, Director- Innovation, Target- India and Parijat Purohit, Co-Founder, WinJam, Singapore will deliver their solo speeches majorly covering how can corporates scale innovations, expand and bring change in a large retail setup. Anup Jain, Managing Partner, Orios Venture Partners. The day 1 will be concluded with keynote session on last mile fulfillment. This keynote session will be attended by Amartya Guha, Associate Director, Pan India Distribution & Last Mile Fulfilment, Flipkart and Rahul Anand, CEO & Founder, Hopscotch.in. The day 2 will commence with keynote address from Shiv Shivakumar, Group Executive President, Aditya Birla Group. Immediately after his keynote address, there would a panel discussion on digital payments. The session will throw light upon recent revolutions in the payment industry . The panel will host the best names in the digital payment industry including Tanya Naik, Director- Payments, PayPal Payments Private Limited, RohitKulkarni, Vice President- South Asia, Middle-east and North Africa, Payoneer, Puneet Jain, Vice President-Online Payments, Paytm, VikasBansal, Head of Emerging Payments, Amazon Pay, Ashneer Grover, CEO & Co- Founder, BharatPe. Immediately to this, PiyushChowhan, Vice President and CIO, Arvind Lifestyle Brands Ltd will deliver the second keynote of the day. His speech will unlock the new age loyalty programs which personalization takes over loyalty programs. This interesting keynote will be followed by the third keynote of the day which will be delivered by Lui Tong, COO & Business Development Director, StrawberryNet, Hong Kong. The end of this session will commence with CEO panel. The panel will share their experiences on building those fundamentals for success including proper organizational structure, how to incentivize for innovation, developing new ideas at scale, as well as junior level executive buy-in and more. This panel will be attended by Rajesh Jain, Managing Director & Chief Executive Officer, Lacoste, ManjulaTiwari, CEO Future Style Lab, Future Group, Vishal Trehan, Group CEO, Inceptra Lifestyle. Final session of IReC 2019 will be on how to minimize the threat of cyber attack. Remaining half of the day will be allotted to Tech Summit Powered by Entrepreneur and interesting round table session on merchandise Intelligence. Starting at 11 AM, Ramyaraj Rath, Assistant Vice President - Head of Merchandising & Planning, Lifestyle International Pvt Ltd. Sameer Shaikh, Head Buying & Merchandising, Bigbasket, Kamaldeep Singh, President- Food LOB, Future Group are the key speakers of this roundtable. The next round which will begin at 12:30 PM will shed light on how the role of CHROS in retail company is becoming extremely crucial. Shrey Srivastava, Head-Talent Acquisition, ShopClues, Akash Chauhan, Director & Head Human Resources, Urban Ladder NiravJagad, CHRO, Nykaa, Ankush Arora, VP & Head - HR, Grofers, Rahul Pinjarkar, CHRO, Trent Hypermarket are the key speakers of this panel. The roundtable conferences will run in parallel to IReC 2019 main hall conference.